Developing stillness is very essential to the cultivation of Knowledge and to the resolution of personal difficulties. We have not talked about stillness a great deal because many people are not yet practitioners in the reclamation and development of Knowledge. Stillness is relevant because it will give you an emphasis to use in developing your own abilities and in recognizing the requirements that are necessary for you to utilize your greater powers of mind. People are very anxious to have very big answers to very big questions. They seek resolution to long-term problems, but when it comes time to talk about practice, well, that is a different matter. Many of the things that are your true goals in life require much development to achieve because you cannot be satisfied with explanations or philosophy or answers alone. Answers are not enough. You must cultivate the real abilities that are essential for successful living here. There is no way around it. There are many shortcuts that are promised, but the methodology is secondary to your will in the matter and to your desire for truth and resolution, which in time will be greater than all other things. Why is stillness of mind essential? Its rewards are quite apparent if you think about it. A still mind is a focused mind. It is a mind that is using all of its resources. It is concentrated upon one thing. It is without the vexation of little distractions. You are able to concentrate your greater strength of mind on one area, and this gives you much more profound insight than you would normally have. Because your mind is quiet, you are not trying to give the situation answers or explanations, so you are able to witness things as they truly exist. Simple enough, but very profound. With stillness, you can exercise the greater powers of your mind; you can have a greater ability for observation and discernment, and you are able to see the necessary way that you must follow. In stillness, things become obvious that would never be apparent to a mind that was in distress or in conflict. This power of concentration will give you tremendous ability in the world, but that is the lesser of its rewards. Its greater reward is that you begin to discern and to experience your own Knowledge, which is the true Mind that you have brought from beyond this world to contribute here. Not all of you wish for the complete reclamation or discovery of Knowledge. Many of you just want to have a problem solved. Here the lesser rewards of developing stillness of mind will give you what you need as well. But We do not want to talk only about the incredible resolution and sense of purpose, meaning and direction this state of mind will yield to you. We would also like to talk about what happens along the way. You are where you are. You cannot be somewhere else in your development. You may dream or think or wish that you could be in a much higher state of mind with greater abilities to contribute, with greater powers over mundane things and so forth. Yet the most valuable thing is the means for getting there. Getting to a place of stillness is even more important than the result, for in achieving this you begin to have the fundamental qualities of concentration, discernment, patience, perseverance, faith, compassion and forgiveness—all things which are very essential. When you are concerned about a problem and are in conflict regarding it, the last thing you want is to become still. You are very eager for answers. “I need the answers right now. I am desperate!” And you go through all the possible answers that you have ever considered or heard about. Maybe the problem is emotional. Maybe it is physical. Maybe it is medical. Maybe it is philosophical. Maybe it is spiritual. And so you go all through the inventory of answers and possibilities because you are afraid. How can you afford stillness of mind? It does not seem to yield any result. Very few of the problems you consider require immediate action. So the first step is to withdraw from the situation. Do not try to answer the question. The first step is recognizing that you must take a more comprehensive approach rather than simply trying to resolve the situation by putting an answer on top of it. This separates you from the problem and establishes that you are greater than the problem itself because you are establishing the means for its resolution. Next, you must take inventory of your preferences regarding the matter. “What are my preferences regarding this situation?” To the degree to which you have strong preferences, it will be more difficult for you to experience Knowledge or know what to do. You will think you know what to do. You will think you have the answer or possible answers, but you have not found the real answer because the greater mind deep within you is not yet able to speak to your conscious mind. Therefore, withdraw from the problem and then begin to review your preferences or anxieties about it. Preferences and anxieties are very similar. They both distract you from focusing upon that place within yourself where the answer can emerge. Then you must see if you really want resolution. “Do I really want resolution?” It requires a great degree of honesty to come to a genuine answer here. If you are not sure, it is better to say no. If you say yes, then in order for this to be genuine, you must be willing to follow any course of resolution, even if it leads away from the preferred outcome that you seek. You see, problems are not hard to solve. The problem is that people do not want their problems solved. What people seek is a resolution which will give them their preferred outcome and relieve them of the discomfort which they are feeling. Here there is plotting and scheming. Here outcomes are considered to be more important than the truth until the truth becomes more important than the outcomes. When you finally reach stillness of mind, you do not care about any of this. You are past negotiation. To approach stillness—this deep state of alert observation in the face of difficulty or dilemma—means that you are at least willing to become quiet and observant rather than struggle for resolution or to achieve something. Developing stillness is one of the essential qualities in healing, in spiritual evolvement and in practical problem solving. Yet it seems so impractical, and this makes you confront your own personal conflicts. This is good, for it makes you confront these things in order to achieve stillness, not to resolve things. If you are attempting to have a still mind and you are still trying to resolve something or get something, you will not be successful. Another by-product of developing stillness is that you develop trust—a very deep trust in your true nature, a very deep trust in God and a very deep trust that there are forces working on your behalf. This means that you do not trust your thoughts or feelings alone. You are trusting something greater within you and beyond you. This is an inherent trust. In some situations, people must not attempt stillness because the problem facing them is quite immediate and they must take action. But overall, to realize what Knowledge is, to experience its power and efficacy in the world, you must develop some degree of stillness. To achieve this, you must persevere and have patience because you do not get instant results. You must fortify your faith that this is genuine and within your reach. Do not be satisfied with answers. It is really the experience that matters. We bestow experience. Experience requires involvement, participation and trust. Anyone can play with answers. We have given many answers and they are like seeds. They can be planted in the mind and grow over time. But it is still your preparation and experience that are most important. People often ask, “How can I be in contact with my own Inner Teachers?” We say, “stillness.” They are still; you are not. That is why you cannot perceive them. Here you are rushing about with your mind grinding thoughts down into powder, always trying to sort things out or see a new way around things, always trying to get the better angle, and your Teacher is standing there. In stillness, you will feel the presence of your whole Spiritual Family. They are calm. You are not. Therefore, unless immediate action is required, calmness is often the best first step. It cannot be a complacent or a passive calmness. It is calmness with a very great intent. It is an intention for resolution without attempting to resolve the situation yourself. In all ages, in all societies, even in all worlds, stillness is one of the primary challenges. Even if you live a very busy life and have lots of work and commitments, it is still relevant. Only a few minutes a day in stillness is necessary. It is not appropriate to say, “Well, I do not have time. I cannot fit it in.” If you cannot fit it in, then you should eliminate some things because your life is out of balance and out of proportion with your true needs. People in modern society have a great deal of information available. You are concerned with many things and are very intelligent, but you are not very strong—either physically, mentally or emotionally. Part of the reason for this is that your mind is concerned with so many things that are unrelated. The fewer things you focus on, the more powerful your concentration will be and the greater the results you will achieve, if a result can be achieved. Therefore, to achieve any degree of stillness or depth within yourself, there must be greater simplicity in your life. One of Our main themes is the cultivation of Knowledge. This is a profound state of knowing, which can be applied to immediate and practical problems as well as to a greater emphasis in life. Knowledge is not something that you can simply dabble with if you have any hope for success because it is more important than this. Since its rewards are so great, it requires a greater investment on your part. That is why it is very important to settle down into a form of practice sooner or later. You have read enough books. There are enough issues to concern yourself with. You have seen all these techniques. Now it is time to practice. It is very important in practice not to try to get results. Most forms of spiritual practice—which is training your mind and applying your abilities—involve simple observation without judgment. This is practicing stillness. Here you begin to set aside the agenda that is wrapping you all up. For students of Knowledge, there are different kinds of practice. There is practice for when you cannot settle the mind down. There is practice for when you can settle it down a little. And there is practice for when it settles down all by itself. There is practice for the dabbling student. There is practice for the semi-serious student. Then there is practice for the serious student. By semi-serious, We are not being critical. It is just that you want some Knowledge, but not all Knowledge. And if you are a dabbler, you just want to see what it is all about and get your feet a little wet. If you want all Knowledge, well, you just jump in! So We have three overall categories. You do not give similar practices to people in different categories. When your mind is very noisy, you practice counting or breathing or listening to your pulse. If your mind is a little unsettled and there is a possibility you may settle down, then you practice with sound. If your mind is settled down, well, you are practicing already. Then We guide your mind to the presence of the Teachers directly. The Teachers are like a reflection from Heaven. They fill your mind full of light. You cannot enter Heaven and still be in the world, but you can experience yourself as an intermediary. Overall, that is the final goal. When Heaven, your Ancient Home, has been partially established here, then you will be able to serve in a higher capacity. That does not mean the world looks any better. It simply means that you are carrying your Ancient Home within you. Our practices are mind-proof. No matter how clever your mind is, the practices are more clever. Why? Because they make conflict unnecessary. If We say, “Look at the floor for thirty minutes,” who can do that? If We say, “Say this word for thirty minutes,” how many people can do that? We can say, “Say your name for thirty minutes,” how many people can do that? “But my relationship? What can I do about it?” We say, “Say your name for thirty minutes. Nothing else.” How many people can do that? Not many. To be able to do that means that you have the power of concentration and other qualities as well that are most beneficial to you and to others. We are going to drive the point home. People say, “I am having so much trouble with my practice!” Stillness. “I can’t.” We say you do not want it. You are still trying to settle things yourself. Observation and tremendous alertness are all you need for most problem-solving. To be alert, you cannot be thinking of something else. Nor can you be satisfied with thoughts or emotions. You are looking for a deeper feeling of resolution. Anyone who has achieved even a small incremental state of stillness of mind is such an asset to other people. You give them your calmness. Most people, you know, simply need a little reassurance that it will be okay and that they have the ability to take effective action. No matter what you are facing in life, no matter what you have or do not have, develop stillness of mind. You will not know what the result will be, but even at the outset you will feel a tremendous relief and relaxation if you are successful. If you have difficulty, you will begin to realize what is standing in your way in everything. A mind that is unfocused cannot perceive correctly, cannot recognize resolution and cannot act effectively. That is why We often recommend for students of Knowledge to simplify their lives so that they can draw on greater resources of energy and concentration and have time to experience some peace. Now people want many things that they do not need at all. Isn’t that true? And sometimes things people never think of are absolutely the essential thing. We can teach stillness because We are still. Particularly when We are not in the fish tank with you, when We are Home, We are still. We are not rushing about, solving the problems of the universe. You have your own little life to try to manage. We have so much more to manage. But We do not have a busy schedule with a secretary because We have learned in life, as you are learning now, how to distinguish between action and contemplation. There is a time to act. And there is a time not to act but to be alert, like a hunter who must wait oh so long for the right moment to act. This ability to stalk your prey, whether it be an animal on the hunt or Knowledge within yourself, is something that has been lost in modern society to a great extent. People are so over-stimulated that they have no sense of proportion. Everything becomes clear when your mind is still. Make a problem list, practice stillness and things will come to you. You do not need to try to work it out or create a better angle. If a problem requires a resolution, an answer will come through you. It will come through you in stillness or it will come to you when you are not thinking about it. That is why it is good when people play musical instruments, do sports or something like that where they are not trying to fix anything. Or if they are trying to fix something here, it is often something so totally unrelated to their dilemmas that there is a possibility that the mind may have an opening and the resolution will simply slip through, like someone escaping from prison. Answer got through! Messenger got through the enemy lines! Stillness is related to escaping fear. Why is this? Because you cannot be still if you are afraid. So you must get tired of being afraid or give up on it to some degree to relax enough to be still. Here you must affirm either consciously or unconsciously that you have faith in a greater power and that your Home is not this world. When you know, truly, that your Home is beyond this world, then you can begin to relax in the world. Then the world’s consequences are not so dire. This does not give rise to passivity. It calls upon a greater responsibility, which indicates that you have come here for a purpose. You have come here to contribute something. This requires development and preparation, focus and true priorities. It calls upon a greater and much more substantial emphasis in life, which is hardly passive. The luxury of being able to relax and to be truly alert, which is not being asleep, is that you are settling into a greater reality, which you yourself possess. You have a very noisy world here. Lots of noise. Why is there noise? Because people are addicted to stimulation. They are afraid of stillness and must have noise constantly going. They must have an outer environment that correlates to their inner state, which is continually turbulent. Turbulence is very stressful and causes all manner of pain and disease. Therefore, for those of you who realize that you are seeking peace more than stimulation, stillness is the way. There are some very fundamental premises for approaching stillness. The first premise is that you possess Knowledge and that you have thoughts. These are the two aspects of mind within you. There is your personal mind, which contains all of your beliefs, assumptions, demands, requirements, feelings, fears, wishes and so forth. Then there is Knowledge, which you have brought with you from beyond, and which is still, concentrated and cannot be defiled. It is hidden within you until you have developed enough for it to emerge. Another premise is that you need great assistance to truly develop yourself, assistance both within the world and from beyond. A third premise is that you have come here from your Ancient Home to contribute something and that you are not doing this for yourself alone. The next premise is that there is God somewhere and that God is always seen as watching. The next premise is that you must become very honest, so much more honest than you thought. Instead of knowing what you want, you must want what you know. That is the honesty We speak of. Given all of these premises, you can begin to develop stillness. To do this, you must enter a formal preparation at some point. A person who can prepare will achieve the true results. That is being intelligent. To think about things and not prepare is not intelligent. If you cannot prepare, it is then better to go out in the world, be a totally worldly person, enjoy the fruits of this world and accept its pains and tribulations. If you cultivate stillness, you will cultivate many other things that go along with it. If you allow Knowledge and your true reality to gradually arise within your mind and your outer life, then you will take the most expedient way to true achievement. That is why We place such a great emphasis on preparation. We could be more dramatic. We could talk about popular, metaphysical subjects and get you very stimulated. But We will tell you something. Most metaphysical information is not worth very much. It is more playthings, more things for the mind to chew on, more things to do before you truly prepare. How many people can be truly intimate with another? Not many. But many people have a great deal of information on the study of relationships—“The Dynamics of Relationships and Communication.” They can talk about relationships all day long, but how many people can be truly intimate? Many people talk about spiritual things, but how many people can be quiet while their mind settles down? Do you see the difference? Your time is precious in the world. It is such a precious opportunity to be here. When you truly prepare, you have cast your fate a little bit. That is good. It is good to move in a true direction. If you are making a mistake, you will know soon enough. Therefore, to practice stillness, let all things come to a rest except the keenness of your mind. Here your mind is all looking and no thinking. Your ears are all listening. Your body is all feeling. Of all practices, stillness is the greatest and the most useless. We say that because to your personal mind, it will be the most useless and to your true Mind, it will be the most useful. The mind that is still can permeate anything in physical life. The life of Knowledge is such a greater life. We cannot compare it to your life here favorably because it possesses such great, great joy. It is still. That is why We practice the state of mind that replicates your true state of mind. Then the bridge between your personal state and your greater state becomes so small that you slip over it easily. The gap has been narrowed and now the transition occurs. 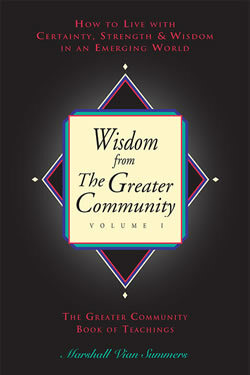 ~ Begin a greater journey of spiritual practice with Steps to Knowledge: 365 guided meditations to your greater inner knowing. ~ Listen deeply to The Night Meditation and be guided to the Power and Presence within you. ~ Listen and read The Lamp which guides you to a greater strength, always alight and always burning deep within you.